LOS ANGELES – This one was easy. 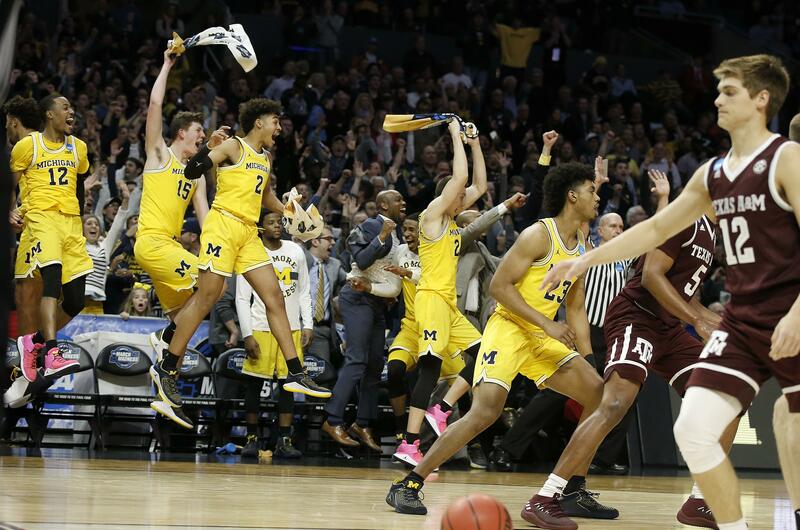 After reaching the NCAA Tournament’s round of 16 with an improbable buzzer-beater, Michigan shot 62 percent from the floor and routed Texas A&M 99-72 in the West Region semifinals on Thursday night to reach the Elite Eight for the third time in six years. Michigan will play Florida State on Saturday with the winner advancing to the Final Four in San Antonio. The Wolverines (31-7) dominated from start to finish, hitting 14 3-pointers – 10 in the first half – and extending their winning streak to 12 games. Muhammad-Ali Abdur-Rahkman scored 24 points, Moe Wagner added 21 points and Charles Matthews had 18 points as third-seeded Michigan had five players in double figures. The Wolverines were good in the first half and even better in the second. The rout was on by halftime with Michigan leading 52-28 after shooting 57 percent from the floor. In the second half, the Wolverines improved to 68 percent from the floor. The Aggies (22-13) never made a run, going long stretches without a basket in the first half while Michigan was scoring on nearly every trip down the floor. Tyler Davis led the seventh-seeded Aggies with 24 points. Michigan won its second-round game to reach the Sweet 16 on freshman Jordan Poole’s long 3 in the closing seconds against Houston. In this one, Michigan led by 29 points after an 8-0 run near the end of the first half. The Wolverines averaged nine 3-pointers per game coming in, and exceeded that by the break. Michigan held the Aggies to 12-of-32 shooting from the floor by double-teaming A&M and getting hands in shooters’ faces. The Wolverines had eight steals, led by Zavier Simpson with five. The Aggies committed 10 turnovers – with five by T.J. Starks – in the half. They improved to 57 percent shooting in the second half, but it didn’t make any difference when the Aggies couldn’t come close to reducing their deficit to single digits. Published: March 22, 2018, 7:10 p.m. Updated: March 22, 2018, 9:31 p.m.